Mike Greene - mgreene@shawmedia.com Jacobs' Cassidy Sherman (left), Amy Rigby and Payton Berg celebrate after Sherman scored a goal during their Class 3A Jacobs Regional Final game against Crystal Lake South Friday, May 18, 2012 in Algonquin. 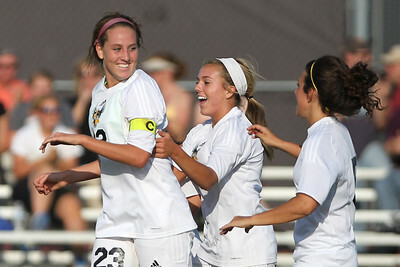 Sherman had a goal and an assist in her first full game in five weeks after a sprained MCL. Jacobs won the game 4-0 to take home the regional title. 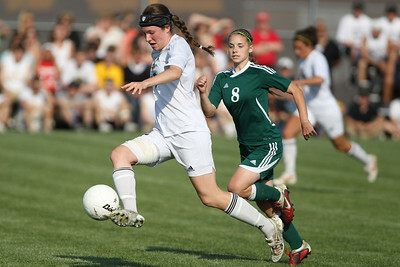 Mike Greene - mgreene@shawmedia.com Jacobs' Lauren Grady (left) controls the ball in the air on offense as Crystal Lake South's Elizabeth Massat defends during the Class 3A Jacobs Regional Final Friday, May 18, 2012 in Algonquin. Jacobs won the game 4-0 to take home the regional title. Mike Greene - mgreene@shawmedia.com Jacobs' Jessica Tennant (left), Margaret Rivera and Payton Berg celebrate after Rivera scored a goal during their Class 3A Jacobs Regional Final game against Crystal Lake South Friday, May 18, 2012 in Algonquin. Jacobs won the game 4-0 to take home the regional title. 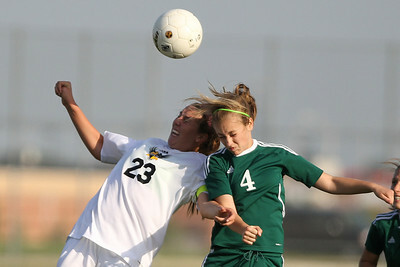 Mike Greene - mgreene@shawmedia.com Crystal Lake South's Cella Albuqerque (left) jostles for control of the ball against Jacobs' Danielle Blanchard during the Class 3A Jacobs Regional Final Friday, May 18, 2012 in Algonquin. Jacobs won the game 4-0 to take home the regional title. 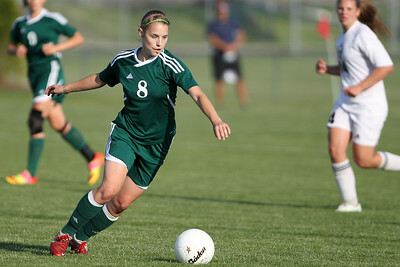 Mike Greene - mgreene@shawmedia.com Crystal Lake South's Emily Schoenfeldt kicks the ball out of the backfield during the Class 3A Jacobs Regional Final game against Jacobs Friday, May 18, 2012 in Algonquin. Jacobs won the game 4-0 to take home the regional title. 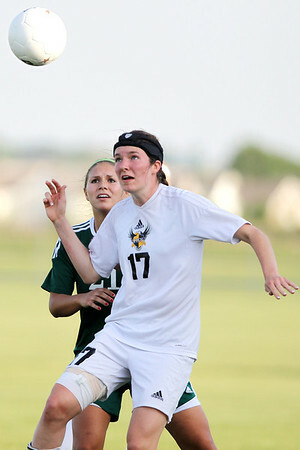 Mike Greene - mgreene@shawmedia.com Jacobs' Jessica Tennant handles the ball during a Class 3A Jacobs Regional Final game against Crystal Lake South Friday, May 18, 2012 in Algonquin. Jacobs won the game 4-0 to take home the regional title. 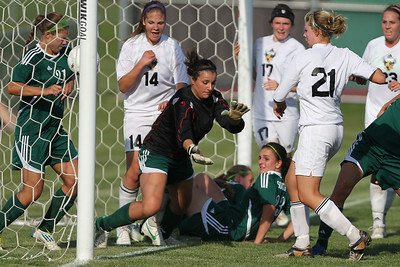 Mike Greene - mgreene@shawmedia.com Crystal Lake South goalkeeper Gianna DiSarno reacts too late as Jacobs' Molly Leopold kicks the ball into the goal during the Class 3A Jacobs Regional Final Friday, May 18, 2012 in Algonquin. Jacobs won the game 4-0 to take home the regional title. Mike Greene - mgreene@shawmedia.com Crystal Lake South's Erin Woeste (left) watches as Jacobs' Cassidy Sherman takes a shot on goal during the Class 3A Jacobs Regional Final Friday, May 18, 2012 in Algonquin. 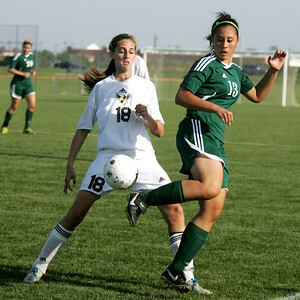 Sherman had a goal and an assist in her first full game in five weeks after a sprained MCL. Jacobs won the game 4-0 to take home the regional title. Mike Greene - mgreene@shawmedia.com Jacobs' Cassidy Sherman (left) and Crystal Lake South's Erin Woeste vie for a ball in the air during the Class 3A Jacobs Regional Final Friday, May 18, 2012 in Algonquin. Jacobs won the game 4-0 to take home the regional title. 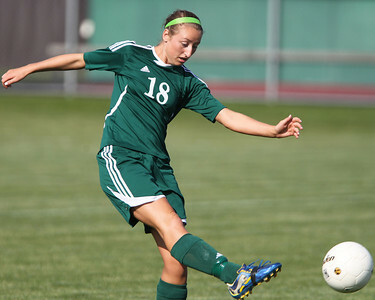 Mike Greene - mgreene@shawmedia.com Crystal Lake South's Elizabeth Massat winds to kick the ball during a Class 3A Jacobs Regional Final game against Jacobs Friday, May 18, 2012 in Algonquin. Jacobs won the game 4-0 to take home the regional title. Mike Greene - mgreene@shawmedia.com Jacobs' Lauren Grady watches a ball drop as Crystal Lake South's Ashley Tyllia defends during a Class 3A Jacobs Regional Final game Friday, May 18, 2012 in Algonquin. Jacobs won the game 4-0 to take home the regional title. Mike Greene - mgreene@shawmedia.com Jacobs' Jessica Tennant (left) reacts as Crystal Lake South's Cella Albuqerque keeps a ball in play during the Class 3A Jacobs Regional Final Friday, May 18, 2012 in Algonquin. Jacobs won the game 4-0 to take home the regional title. 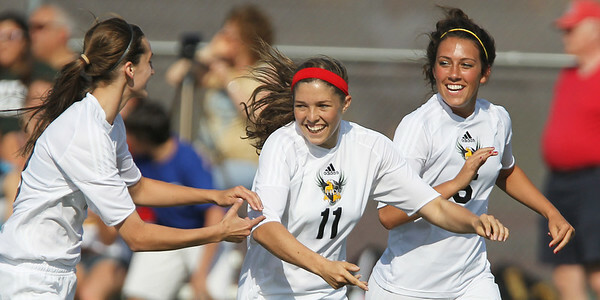 Jacobs' Jessica Tennant (left), Margaret Rivera and Payton Berg celebrate after Rivera scored a goal during their Class 3A Jacobs Regional Final game against Crystal Lake South Friday, May 18, 2012 in Algonquin. Jacobs won the game 4-0 to take home the regional title.